On November 30th the LAPD cleared out the LA Occupy encampment with a massive police action that was hailed in most mainstream media outlets as being peaceful and well-conducted. Being a defiantly mainstream media organization - NPR jumped on the bandwagon of LAPD-love with two features on its November 30 Morning Edition. One involved Renee Montagne interviewing Frank Stoltze a reporter at NPR affiliate KPCC. Stoltze described "a massive police operation" that was "a largely peaceful operation" and commented that the protestors were "quite well-disciplined." Stoltze also claimed that the police action was due to "concerns about public safety' and because "there was some drug use going on." At that point Montagne interrupted him to say "And drug dealing, I mean there were some stories of you know, you know homeless encampments that had encroached on the encampment." [Of course "some stories" is all the evidence Montagne produces to substantiate such a provocative claim]. The second story featured Inskeep interviewing Frank Stotlze who explained that "in the end there was very little force used...in part because this is a new LAPD." The interview covered much of the same material as the Renee Montagne piece. First, the coverage of the raid was restricted to 12 members of a media septic tank pool. Like the restrictive media pools of the US military these "pools" are meant to tightly control access to what is actually happening and to favorably tilt coverage toward those who set up the pool and grant/deny access to this "pool" - in this case the LAPD. You would think, just the very concept of the police media pool would raise journalistic concerns - unless your news organization is tiltled toward spinning press coverage in favor of police actions against dissidents. Second, and most important, a lot of rough and very ugly police behavior occurred outside the coverage perimeter that the media pool had access to, and to those who were arrested once they were out of the range of media pool coverage. Ruth Folwer of Occupy LA reported on police "kettling," rough tactics, and arbitrary arrests that occurred on side streets around the main occupy crackdown. Lisa Derrick documented police use of "non lethal" weapons on non-violent, non-resistant LA protesters. The LA Weekly blog noted the brutal police attack on photojournalist, Tyson Heder. 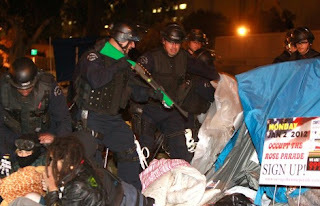 Patrick Meighan, one of the writers for the popular FOX cartoon, Family Guy, has posted a very detailed description of his first hand experience of the rough treatment meted out to those arrested at Occupy LA. A very similar picture emerged from Exiled editor, Yasha Levine's description of his treatment by the LAPD. The Brad Blog gathered evidence of both the deplorable conditions endured by arrestees and the use of police violence against protesters during that "largely peaceful operation" by the "new LAPD" that NPR's Frank Stoltze was so impressed with. Any organization that claims to be doing journalism would recognize that it has a duty and responsibility to revisit a story/s which future events and facts have shown was so distorted, truncated, and false. It's bad enough that NPR considers it acceptable to adopt the servile role of reporting from a police-picked/ police approved "pool" - but even more disturbing is its utter lack of follow-up in correcting the misinformation conveyed in that report. Given that we are talking about NPR (which has a fondness for jack-booted police tactics and for the expanded powers of the surveillance state) it really is no surprise at all that NPR has purposely ignored the evidence that their two main feature stories on the police action against Occupy LA were nothing but pro-police propaganda filled with inaccuracies and spin. "There were a lot of protesters who were saying [Rabe imitates them with snarky intonation] 'This is what a police state looks like.' And it's not what a police state looks like. They may not like the lines of cops, but nobody was shot down like in say Syria, Egypt, Libya - these are police states; I don't think that helps the Occupy LA's cause by having people shouting dumb stuff like that." Surprising that they would report that anyone uttered the phrase, "This is what a police state looks like," even if only to shoot it down. Seems like NPR has a messaging problem. Why should we listen to NPR if they don't have a coherent message? No one wants to hear from a group that doesn't have a simple message. Excellent will documented piece on NPR's slanted pro-Police State reporting, once you normalize your government's torturing prisoner as "harsh interrogation" suppression of dissent, violence against non-violent protestors, extra-judicial executions aren't a big deal. To paraphrase Swift "Once NPR agreed on the principal, human rights don't matter, its only a matter of discussing the price." "Well you have been accused of liberal bias and we are not going to give you any more policy assignments," he summarily announced. I was stunned -- accused of bias for reporting that people are hungry? "But Ken, you edited the piece yourself," I stammered, "Where exactly was the bias?" He had no answer, and I sensed from his halting tone that he was not happy, either. But the higher ups at the network had spoken, and I was now blackballed from reporting for the NPR newsmagazines, though I continued doing occasional pieces on the fringes of the public radio world for a while longer." hear! Hear! Nice piece on occupy. We are going to have to learn some hard lessons before this is all over. The "press" is not our friend. "Liberal politicians" are not our friend. and not to quibble but . . . we are fast becoming a "police state" but we really are not there yet (though I sure as hell can see it from here) because police states (many of them American friends and allies) do tend to use deadly force. We (America) will also use deadly force (never forget Kent State, Jackson State, People's Park) unless this Occupy can be co-opted or criminalized. I am not surprised that npr (1% Radio) would dispute this chant by comparing us to "them". Why not compare America to what Scott Simon, Inskeep, Montaign and the rest say we are? Oh yeah, in case the "message" isn't clear let's ask Delaware why they would put up millions for Amazon to locate there. I mean when you are worth billions you should be able to compete on your own. "OK, so the tree fort is on its way out." ...and so is Inskeep, though he is too stupid to realize it. and my guess is that the supposed "quote" that "This is what a police state looks like" was simply made up as a lead-in for the journalist. These people at NPR are certainly not above just making stuff up to fit whatever claim they happen to be peddling. i heard another "a rare display of bi-partisanship" Federal cuts (by about 50%) to LIHEP in the northeast. Now they (the cuts) must have passed a Republican House, a Democratic Senate and were signed by a Democratic President. If that's not the very definition of bi-partisanship I don't know what is. Terry Gross named #1 in download podcasts. So there! What is it with the innumeracy at NPR? Tens of hundreds are hundreds...sure, but more properly, tens of hundreds are thousands. gDog: I listen to WHYY out of Philly and i keep hearing the phrase "more mild" when discussing weather. These are the people whyy hypes as smart, involved and aware (or whatever flattery they got at the moment) but can't use the word "milder"? in addition to the grammar point: "mild weather" seems to be the accepted euphemism for global warming/climate change. as in: "we've had 4 of the 6 mildest years on record in the past decade"
Oh, man, you so got it right. I'm so sick of Inskeep's sneering myself, and dead tired of NPR's US-of-A jingoism. It left a bad taste in my mouth in late 2002/3, as Bush & Co took us to war, and a nation's destruction, and I'm still tasting it today when they report on Occupy, or Wikileaks or WHATEVER.